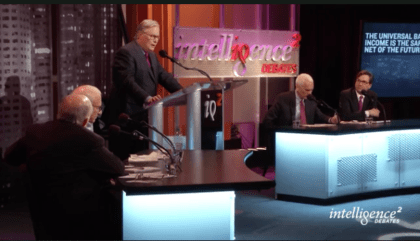 On March 22, 2017, the popular debate program Intelligence Squared U.S. (IQ2US), hosted and moderated by ABC News correspondent John Donvan, held a debate on the question “Is the universal basic income the safety net of the future?” Specifically, the panelists debated the proposal of a $12,000 per year UBI for Americans. On the “yes” side, Andrew Stern, former President of the Service Employees International Union and author of Raising the Floor, partnered with libertarian author and scholar Charles Murray of the American Enterprise Institute. Their opponents were two leading economists of the Obama administration: Jason Furman (Chairman of the Council of Economic Advisors to President Barack Obama) and Jared Bernstein (Chief Economist to Vice President Joe Biden). Prior to the debate, members of the live audience were asked whether they were “for the motion”, “against the motion”, or undecided. During the first round of the debate, each debater was given time to make opening speeches delineating their positions. Initiating the round, Stern argued that current welfare programs are insufficient, leaving millions of Americans in poverty, and that impending job disruption due to automation will make the economic situation even more dire. Opening for the “against” side, Furman maintained that the threat from automation has been overblown, that UBI is not financially viable–at least without removing benefits from those who need them–and that there are better policy options, such as programs designed to help individuals obtain jobs. Next, Murray argued that a basic income would open more options to individuals, remove the need for the poor to supplicate themselves to government bureaucrats to receive benefits, and restore more responsibility to family and friends in supporting one another’s needs. Finally, Bernstein laid out a case that basic income would waste resources on those who don’t need them, eliminating funds from programs that could do much more to help poor and middle-class Americans, ultimately to the detriment of those who need help the most. The opening statements were followed by an interactive debate moderated by Donvan. This second round began with the question of the extent to which technological unemployment is a real threat. While Furman emphasized that earlier fears of mass job loss to automation turned out to be unfounded, Stern and Murray contended that the threat is indeed significantly greater now. Meanwhile, Bernstein stressed that there is still plenty of work that needs to be done today. Redirecting discussion from the impasse over the magnitude of the automation threat, Bernstein stressed that the most important point of the “against” side is not that automation is not a major concern, but that UBI wastes money on those who don’t need it, rather than investing that money in programs targeted at the most vulnerable. In response to assertions by Stern that the poor are obviously better off under a UBI, given that they have an additional $12,000 per year, Furman challenged the arithmetic of the “for” side–challenging Stern and Murray to explain how their UBI can be financed. Near the end of the round, the debate shifted to the more “ephemeral” parts of the pro-UBI argument, focusing on the potential impact of UBI on civil society. After the second round of the debate, members of the studio audience were invited to ask brief questions, and, finally, each of the four panelists summarized their key points in two-minute closing statements. At the end of the debate, the audience members were against asked to vote “for”, “against”, or “undecided” on the motion that UBI is the safety net of the future. In the end, the “against” side clearly dominated the contest. While only 20% of attendees were opposed the motion prior to the debate (with 45% undecided), fully 61% were afterwards. Meanwhile, the proportion in favor dropped from 35% to 31%. The “against” side also won in a poll of the online viewing audience, although less starkly. At the beginning of the debate, 49% of online viewers expressed support for the motion–rising to 53% by the end. The percentage against, in contrast, started (and ended) smaller, but saw a much larger increase–from 19% to 42%. It is important to keep in mind that these results reflect the views only of a small self-selected group of individuals, and thus neither the “before” or “after” votes should not be taken as representative of Americans’ views on UBI. “The Universal Basic Income is the Safety Net of the Future” at Intelligence Squared Debates. I also want to add that i think it’s bizarre that almost every country has a central bank. The basic income proponents “lost,” in my opinion, because they never questioned conventional assumptions about jobs, welfare, finite budgets, the social safety net, the economy, and the role of government, Bernstein and Fuhrman are professional economists and liberal Democrats, In their models, government has limited funds and seeks mainly to help people get jobs. They also seem to believe in the possibility of a new version of the New Deal or Great Society. How? When? Proponents have to reclaim and reframe the discourse. Basic income is only way to achieve real freedom and personal dignity for all. And we can succeed within three to five years. The Bernstein/Fuhrman fantasy condemns millions of people to many years of hunger, homelessness, and other hardships. I completely agree with this, Steven. In my role as reporter, I don’t divulge my own opinions. Backstage, however, I am frequently taken aback by the fact that so many support UBI without questioning such basic assumptions about the organization of society. I was myself initially drawn to UBI precisely as a way to question status quo assumptions about the role and importance of work, jobs, careers, productivity, growth, and so on, which I have long found outmoded and distasteful. In principle, I understand why some support UBI merely as an expedient way to reduce poverty, mitigate the effects of technological unemployment, etc, and why they might want to promote the policy while making as few other waves as possible; however, this approach has never had any resonance with me. Hopefully we’ll talk more about this at NABIG! But it occurs to me that, with a fair tax system (which is an entirely different issue), most of the money that is given to these people who don’t need it would be “clawed back,” as economists say. That is, Bill Gates would end up paying back the amount granted by BI and (hopefully!) then some. I am disappointed that I did not hear proponents point this out in the debate videoed here. I often give that argument. When any UBI program is enacted, we will need more revenue, that revenue will likely be generated by taxes on the most wealthy, so whatever that receive in UBI will be less than their taxes, in effect their UBI will be taxed back along with non-UBI income to pay for the UBI of others. However I don’t think that the opponents just stopped at the argument that we shouldn’t be giving an UBI to those whom don’t need it. They made the argument that if we did tax the wealthy more and got more revenue, that there were other priorities before giving out an UBI to everyone, and according to their argument a means-tested targetted program will be more efficient so that the revenue can go where it is most needed. However if a UBI were to be means tested, well first of all it would not be an UBI anymore, and second of all we would probably end up where we started. In addition means-testing usually leads to a welfare trap. I have some more thoughts on that, but I use a lot of math. I want to personally mention that I do support an UBI, and unless another mechanism comes around that can ensures that every human has a right to a minimum standard of living regardless of any circumstances or employment, and change effectively change the toxic nature of work today, I will continue to support an UBI.